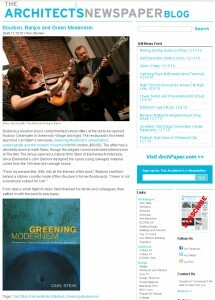 Last Thursday, December 9th, Elemental hosted the launch party for principal founder Carl Stein's new book "Greening Modernism". Tom Stoelker of the Architect's Newspaper writes: bodacious bourbon pours complimented savory vittles at the yet-to-be-opened Hudson Clearwater in Greenwich Village last night. The restaurant’s first event launched Carl Stein’s new book, Greening Modernism: preservation, sustainability and the modern movement (W.W. Norton, $60.00). The affair had a decidedly down to earth flavor, though the elegant crowd resembled intermission at The Met. The venue seemed a natural fit for Stein of Elemental Architecture, since Elemental’s John Barboni designed the space using salvaged material culled from the 180-year-old carriage house. “From my perspective, it fits into all the themes of the book,” Barboni said from behind a kitchen counter made of the structure’s former floorboards. 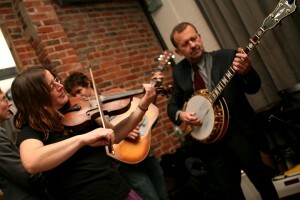 “Green is not a newfound subject for Carl.” From atop a small flight of stairs Stein thanked his family and colleagues, then settled in with the band to play banjo.